The Butcher Shop at Kishki World Foods features one of the largest halal meat counters in the Kitchener-Waterloo region. We pride ourselves on our personalized service and have skilled butchers available to prepare your meat just how you like it. We will custom cut your meat however you want and our knowledgeable butchers can give you advice and tips on how to prepare and cook your meat. 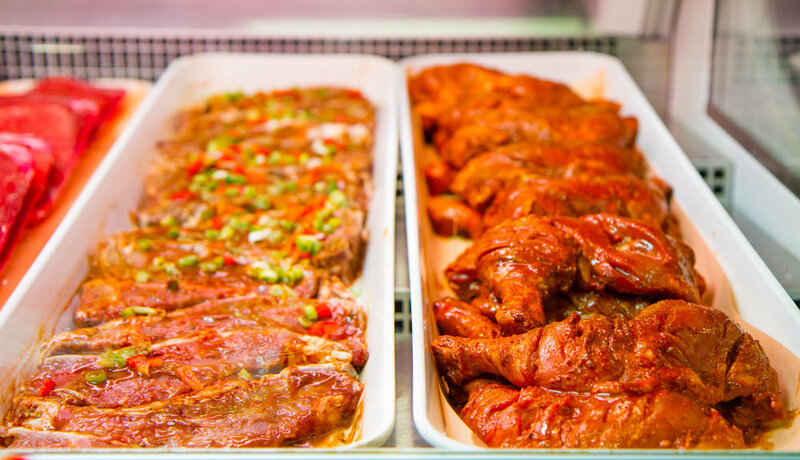 We carry cuts of chicken, duck, Cornish hens, beef, veal, goat (whole or cut to order), lamb, liver, hearts & brain, bones, marinated chicken and beef, shwarma, house made burgers and sausages, and a selection of frozen fish and seafood. We are happy to offer competitive pricing for wholesale orders. Contact us for more information.